If you’re not familiar with this blog, here’s the basic idea behind each weekly meal plan: Alittle advance planning and meal prep work every day is the key to getting delicious, wholesome, good for you, home cooked meals on the table several nights of the week. A little = a lot. On this page, you’ll find a meal plan for the week. 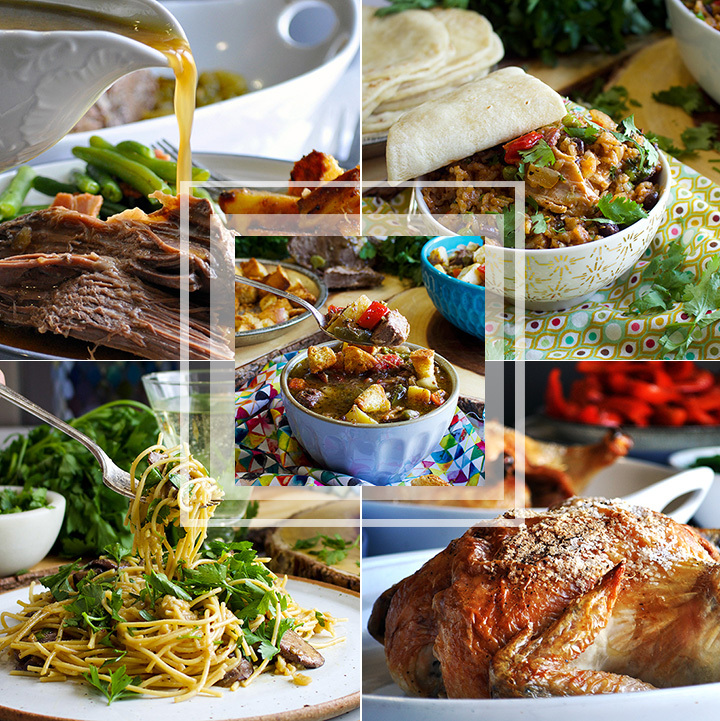 Each meal is designed to build on the previous night’s efforts by using leftover ingredients. You’ll also find a preparation schedule and grocery list. For me, “Day #1” is usually a Sunday, and it’s the day with the most heavy lifting when it comes to meal prep for the rest of the week. I am always so grateful to myself for taking a couple of hours on Sunday to make getting dinner on the table that much easier the rest of the week. 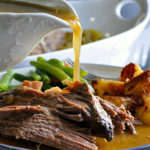 Early in the day, follow the pot roast recipe instructions to add the roast to the slow cooker and let it cook for about 8 hours. After dinner reserve leftover pot roast AND the leftover cooking liquid. You’ll use both in Leftover Pot Roast Soup on Day #5. Make 1 & 1/2 times the recipe for Roasted Potatoes, using 5 lbs of potatoes and 2 packets of onion soup mix. Reserve the leftover potatoes for Leftover Pot Roast Soup on Day #5. Double the recipe of Green Beans with Bacon. Reserve 1 cup leftover beans for Vegetable Rice Pilaf on Day #2. Save any other leftover beans for Leftover Pot Roast Soup on Day #5. Make a total of 6 cups of sautéed veggies tonight. Serve one third of the vegetables for dinner tonight. Reserve one third of the vegetables for Vegetable Rice Pilaf on Day #2. Reserve the remaining third of the vegetables to serve alongside Cuban Chicken and Rice on Day #3. 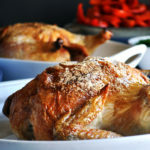 Roast one or two chickens, depending on how big the chickens are, how much you believe your family will eat, and whether or not you’d like to have some leftover roast chicken meat in your refrigerator or freezer. Make Vegetable and Rice Pilaf using the leftover Green Beans with Bacon and Perfect Sautéed Vegetables you reserved from last night’s dinner. I also like to serve this meal with a few slices of sourdough or French bread. If you choose to do the same, use the leftover bread to make croutons to top the Leftover Pot Roast Soup on Day #5. You might even want to prep the croutons while the chicken is roasting, sliding them into the oven as you pull the chicken out. After dinner, pick all leftover chicken from the bones and use the chicken bones to make ultra simple chicken broth, letting it simmer on the stovetop or in the slow cooker overnight. Reserve 3 cups of the chicken broth for Cuban Chicken and Rice on Day #4 and the rest of the broth for Leftover Pot Roast Soup on Day #5. Use some of the homemade chicken broth you made earlier in the week for this simple one-pot meal. Reheat the remaining Sautéed Vegetables that you cooked on Day #1 in the microwave and serve alongside Cuban Chicken and Rice. If you’ve never made homemade tortillas, I encourage you to try it. They are much easier than you might think, and infinitely better than anything you can purchase. 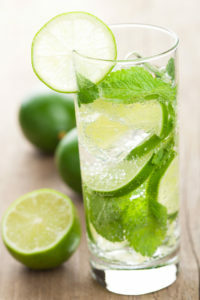 Consider serving tonight’s meal with a Classic Cuban Mojito. 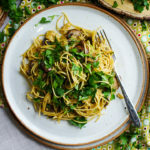 In this vegetarian version of spaghetti carbonara, caramelized portabella mushrooms and smoked mozzarella replace the bacon for a dish that even meat eaters will love. The recipe calls for dried pasta, but homemade fresh pasta is even better. If you’ve never made homemade pasta but want to try your hand at it, here’s a pasta making picture tutorial that will take you through the process, step-by-step. Tonight’s soup will be on the table in less than 30 minutes and is your reward for all the leftovers you made earlier in the week. 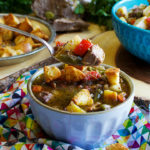 Use leftover pot roast and the reserved pot roast liquid, roasted potatoes, green beans with bacon, sautéed veggies, and chicken broth to make this warm and comforting soup in a flash. 4 – 7 lbs beef chuck roast, depending on how many people you’re serving and how many leftovers you want. For a family of 4, you’ll need 4 lbs for this week’s meal plan. 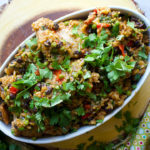 For Cuban Chicken and Rice on Day #3, you can use a 15 oz can of black beans (included in the shopping list), or opt to cook a batch of dried black beans in the slow cooker. Ingredients for cooking dried black beans not included in shopping list. Click here for recipe and ingredients.